This modern grimoire is written as a series of single-page chapters, each with an accompanying commentary page. Some chapters are so short that they consist of one paragraph and an illustration. There are only about 150 pages in total. But don’t be put off by the book’s brevity; it is more than made up for by a complete absence of hand-holding. 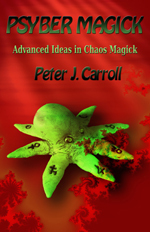 The author goes straight to the point, without apology to any newcomers in magical thinking – and Chaos Magic in particular. In other words, this is not the book to read if it’s your first foray into the occult. You will likely be confused and disappointed. As for me, I was happy to be able to sink my intellectual teeth into something of substance without wading through reams of introductory material. The author is skilled at communicating deep insights in a highly confined space, often with humour. The illustrations are not simply meaningless additions to the text; often a striking image can imprint an idea on the mind for more effectively than words. Sometimes Carroll would communicate something that I would instantly understand, while I could also see that it was something many others would find irrational. But while I often felt like an “insider”, it’s equally true that parts of this book baffled me. Maybe that means aspects of Carroll’s philosophy are weak, or maybe it means there’s something I’m not seeing yet. Hard to tell. Carroll makes some striking cosmological claims, which he attempts to back up with equations pertaining to his own theory of three-dimensional time, i.e. time has three dimensions, just like space. I can’t quite wrap my head around what 3D time “looks” like. He comes very close to claiming that this theoretical framework gives him a theory of everything – the holy grail of science. Carroll does not believe that the universe originated with a singularity, nor will it end with one. The universe has always existed; it is finite but unbounded. In other words, it has no edge, in a similar sense to how one can travel around the world without ever reaching the “edge” of the world. Of course, the world has no edge, and we realised that once we transcended the flat-earth model. Similarly, our notions about an edge of the universe will be dispelled once we transcend the current view of the universe. Fascinating, mind-bending, unothodox stuff. True? Well, given my personal interest parapsychology, I’m not the sort of person who sides with a prevailing scientific orthodoxy on strength of numbers, but I do detect what appears to be a serious flaw in Carroll’s model. If the universe has no edge, but doubles back upon itself, why do we see blackness in space? Wouldn’t the light of all the stars reflect infinitely, causing us to see a fully lit night sky with no gaps. Imagine yourself standing in a dark featureless room that is mirrored on all sides, including the floor and ceiling, then you light a candle. All the darkness would be banished. Similarly, space would not be black if the universe has no edge. Maybe I’m wrong, but that’s how it appears to me. Stephen Hawking, in A Brief History of Time used a similar argument against the view that the universe extends infinitely in all directions. The most memorable idea in the book, for me personally, was the notion of multiple selfs – not in the sense of everything being one consciousness, but the view that our personality is just role we play, an accumulation of habits that now come naturally. Given that personality is fluid and changeable, why settle for just one? Why not play many roles? To an extent, we all do this already. For example, there are probably some people you are willing to say cusswords in the presence of, and others you won’t. We tailor our personalities to suit our audiences. So why go for half measures? Why not really exploit this ability and create multiple selfs – a sort of consciously governed Dissociative Identity Disorder? Carroll has the quirk of constantly referring to himself as “ourselfs” throughout the book. The beauty of Carroll’s writings is that they give the reader theoretical ideas to play with. They allow you to examine the universe (and oneself) in ways not often noticed. Unfortunately though, in comparison to Carroll’s first work, Liber Null & Psychonaut, I would not consider Psyber Magick essential reading. I’ve now read four Chaos Magic works, and the ground is definitely thinning at this point. I fear I may have mined Chaoist philosophy to the point where it has little more of substance to offer. Still, worth a look. This entry was posted in 1990-99, Occult, Paranormal, Peter J. Carroll, Philosophy, Psychology. I have been playing with the idea of 3D time myself, and I am pretty sure that time is at least 3D if it exists at all, and is not a complete illusion. (See my blog (suliwrites.wordpress.com) post “Time and Place”, and several others on Time). I have also been playing with the idea that you put forward of the darkness. I agree there is something not quite right somewhere in what we have been told about the Sun and the darkness, and why don’t we get more light when the Sun is on the other side of the world? If you try and replicate the whole thing (in your head) with a ping pong ball etc, and a torch, it just doesn’t add up. And I can still see light when I am in the shade of a building, but not when I am supposedly in the shade of the planet, why? I actually think we are probably on the inside of the globe, and the Sun etc are like one of those disco balls hanging in the middle. The fake blackness reminds me of the blackness and bright studio lights of the Moon landing footage. Sorry for lack of links, having trouble getting through to wordpress at the moment.